Poplar Chapel Church of Christ is located in a rural setting southeast of Jamesville at the intersection of Jerden Thicket Road and Poplar Chapel Road. It began as an off shoot of its mother church, Welch's Creek, also know as Free Union. 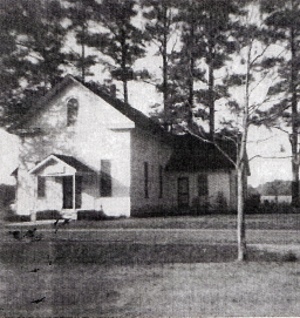 Welch's Creek Church was the first Disciples of Christ church in Martin County. According to Religion and Education in Martin County 1774 – 1974, Indexed by Francis Manning and W. H. Booker, The Enterprise Publishing Company, Williamston NC, Welch's Creek (Disciples) had a congregation composed of Indians, slaves, free blacks, and whites. It appeared in the county in 1841, following the Methodists, Episcopalians, and Baptists. While Welch's Creek dissolved in 1873, there are daughter churches that remain. They include Uniontown Free Union, the oldest black church in Martin County, established in 1854, and Poplar Chapel Church. Members from Welch's Creek also began attending Christian Hope. Poplar Chapel was officially organized November 25, 1866 with 27 charter members. The church was enrolled as a member of the State's Disciples on October 13, 1867. It was known at that time as Poplar Run because it was located about half mile from its present site on a branch know as Poplar Run. The first building put up cost $75. In 1871 it was rebuilt at an additional cost of $175. Sometime thereafter the church was moved to its present location on land provided by Sylvester and Sadie Davis. It was renamed Poplar Chapel. A Sunday School program began there in 1890. At a meeting at Poplar Chapel in September, 1883 “the Missionary Cooperation” decided to receive a collection to be used to build a building in Jamesville. This was the beginning of Jamesville Christian Church. Dennis Wrighter Davis held a revival at Poplar Chapel in 1897 and it is recorded he referred to the “new house of worship” as “A comfortable house and no debt.” In September 1899 another revivalist commented, “Their house of worship is a great improvement on the old hull in which we used to meet. While there are no rich people in the church, they promptly meet every obligation.” In 1902 the church was clear of all debt and raising money for missions. In the 1920's there was a movement to leave the Disciples of Christ and Poplar Chapel joined other churches in the county in doing so. It became known as Poplar Chapel Church of Christ. Since its beginning Poplar Chapel has built, rebuilt, relocated, and enlarged with recent additions.. From its present location the building has been moved back from the Jerden Thicket roadway, had Sunday School rooms and a porch added , and the exterior bricked. This work was completed around 1974. In 1979 a baptistery was installed in the sanctuary. Prior to that time baptisms were held at Roanoke Christian Service Camp, and in near-by creeks in Farm Life, at Tar Landing bridge, and originally in the Poplar Run creek. A fellowship hall, classrooms, kitchen, and office were added. Later a breezeway and storage buildings were built. Additional land has been purchased to accommodate any future additional expansion. The first parsonage was built around 1977 on land donated by Hillary and Ione Holliday. In 2013 that parsonage was sold to a former minister and the Holliday house, located directly across from the church, was purchased and renovated as the new parsonage. Poplar Chapel Church of Christ is an independent church of Christ with no ties to any other governing body nor to any denomination. Listed below are the preachers that have served Poplar Chapel/Poplar Run since its inception. Also, we currently have five Timothys. One serves a sister church close by, two serve missions in the US, one at a Christian camp, and the fifth serves in Bosnia. Recently two paid positions have been added—Youth Minister and Secretary. Ministries have been defined and organized to better address the needs of those around us and within the church. Members and friends are responding in a mighty way to serve God and the community. A new men's brotherhood will be organized in the coming year, 2017. Special events and other outreach programs have been added as well. God has blessed Poplar Chapel with dedicated ministers and members for over a century that have shared His grace and message of salvation and we look forward to working and witnessing ourselves over the coming years. Ministers serving Poplar Run/Poplar Chapel.